When I think about a Mexican food memories from my childhood this dessert is one of them. I’ve never going to forget when we used to go to my grandma’s house, my auntie Laura, used to make flan for use every time we were there and every time I used to end up licking the plate, that sugar syrup is addictive and the custard is just amazing and the good news is, that is just so easy to make, that I feel a bit embarrassed to be posting the recipe here, but as my friend Claudia said to me, “there are people that don’t know how to make it” so here it is. 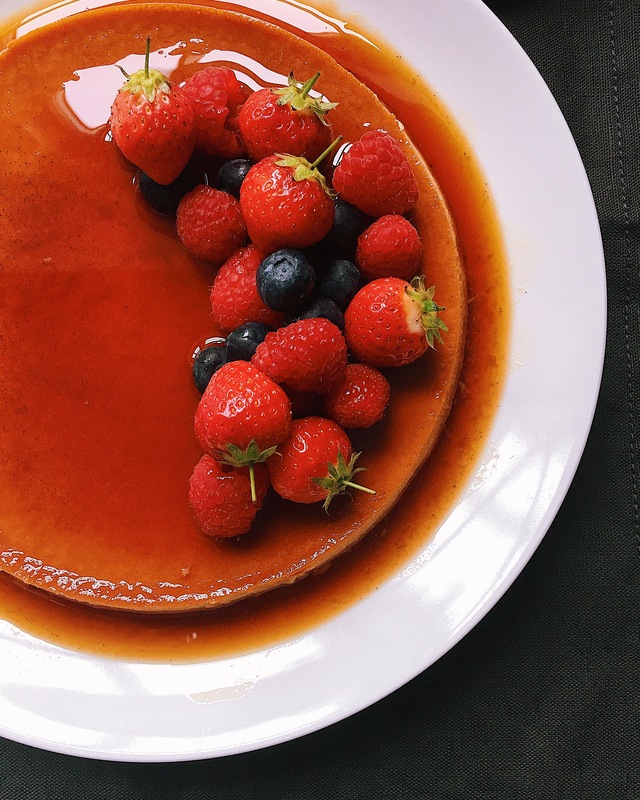 So this is a classic flan, the way we do it Mexico, I know that probably we all have a special way to make it, but this is the way I have always make mine and it always comes out just delicious. Preheat your oven to 160 degrees fan assisted 15 min before starting to make the flan. To make the caramel have your cake tins or ramekins ready. In a saucepan add the caster sugar and put it to melt in medium heat. There is no need to add water or stir the sugar. But do look after it as it will start melting quite quickly. Once starts becoming caramel (melting golden brown mixture) just move the saucepan, so all the sugar melts evenly. Do not let it burn and handle it with care as it is very hot. The caramel has to be golden brown. Once the caramel is melted, you need to transfer it quickly into the containers, otherwise it will cool down and get harden. Pour half into one cake tin and lift the tin and move the caramel around the tin (be very careful because the caramel is very hot) until all the base of the tin is cover with the caramel, set aside and do the same with the other cake tin. Or pour evenly into the six ramekins. Then set them aside until the caramel has cool down. To make the custard. Pour the tins of evaporated, condensed milk & full fat milk in a blender then break the eggs and add them to the milk together with the 2 tsp of vanilla essence or if you use a vanilla pod, add the vanilla seeds. Then blend for 3 min. Once the custard is done, pour it evenly into each container, don’t worry if you hear the caramel cracking is normal. Then cover each container with aluminium foil and place them onto the deep baking tray. Then pour some cold water until the water richer half of the containers. Place the baking tray with the flan tins in the oven and cook in a bain mary for 30 min if you used the 20 cm cake tins and 20 min if you used the ramekins. If you do not have an oven you can used a casserole dish or dutch oven. Place the tin or ramekins in the casserole and pour the water reaching just half of the containers. Turn the heat on high, bring the water to a boil and turn the heat all the way down. Cook like that for 20 min. To check if they are done, prick them with a toothpick and if it comes out clean that means your flans are ready. Take them out of the oven and leave aside to cool down, then put them in the fridge for a few hours or until next day. 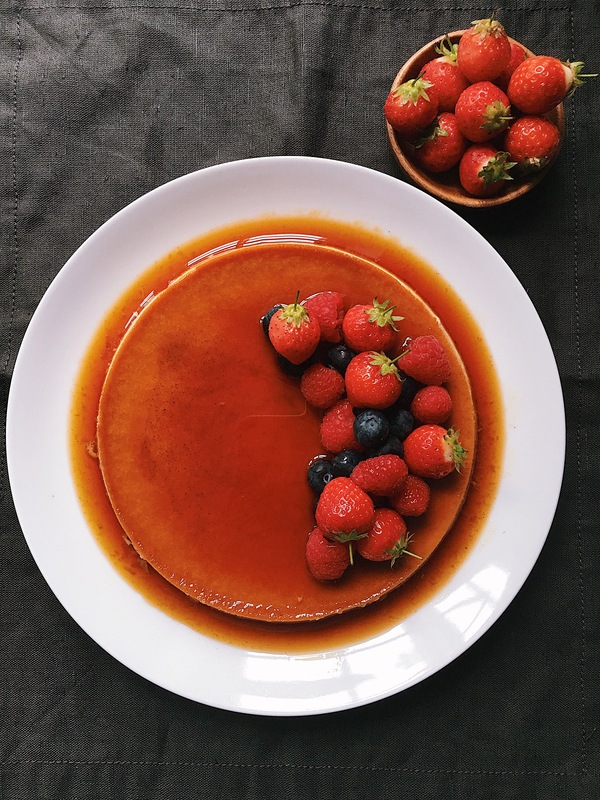 To serve, just run a sharp knife around the edge of the tins or ramekins, then put a flat plate on top and with a fast move, turn it upside down and let the caramel run around. Place some berries on top and serve them either individually or as a whole, like in the picture. Enjoy!